A Madison man who got President Barack Obama’s signature on his cheesehead hat has donated the headgear to the state historical society in Madison. Mansfield Neblett wore the hat during last week’s presidential visit to J.C. Wright Middle School, where Neblett’s daughter is a student. Asked to remove the cheesehead during the president’s speech, Neblett asked for something, too: the president’s signature on the bright yellow foam rubber lid. After thinking about selling the hat, Neblett decided to donate it instead. 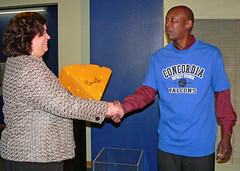 Neblett presented the cheesehead to staff at the Wisconsin Historical Society Museum on the Capitol Square in Madison.